Reference number for this case: 22-Sep-54-Banyuls-sur-Mer. Thank you for including this reference number in any correspondence with me regarding this case. LODEVE. -- The mysterious machine commonly called "flying Cigar", reported in the Puy de Dôme and the sky of Rome was seen Saturday, September 18 at 7 p.m. very precisely, by three residents worthy of faith of Lodève, in the North of the department of Hérault, as it moved at 1.500 meters of altitude approximately. The object was goings towards the South. The witnesses were able to observe during nearly five minutes a pointed front, towing a brightly lit sphere of fire red color and moving without noise roughly at the speed of an ordinary plane. On their side, returning from a patrol during the night of Tuesday to Wednesday, two gendarmes of Chateauroux, Misters Courtaud and Péninon stated to their chief that they had seen between 9:15 p.m. and 9:45 p.m. above la Fleuranderie, commune of Montlerchaume (Indre), a luminous machine immobilized in the sky, at a height of approximately 1.500 meters, then two others of greenish color at a greater altitude. The three mysterious objects, after having veered at right angle, reportedly took the direction of the North-West, South-east. Mr. Louis Moll, guard-pastoral in Oberdorf (the Moselle), stated to have seen, Sunday, around 9:15 p.m., an intense gleam coming from space and touching the ground in the east of Tromborn. This gleam, similar to that of a neon tube, the guard added, and coming from an object of rather vaste proportions, changed color. It became reddish and Mr. Moll claims to have seen "black spots" moving silently. The object, motionless during nearly 40 seconds, started to rotate and carried out an almost vertical rise, taking the aspect of an orange ball and being flattened before disappearing at a vertiginous speed, in the south-eastern direction. The total duration of the phenomenon was one minute approximately. The authorities who recorded this declaration, opened an investigation. A "flying cigar" above Banyuls-sur-Mer? PERPIGNAN. -- In the night from Wednesday to Thursday, three young boys from 16 to 17 years old, who walked on the pier of the Banyuls-sur-Mer harbor (East. Pyr.) saw in the sky a flying object going at high speed and from which red and green flames seemed to leave. A little frightened, the boys went to tell their adventure to various consumers who were at the terrace of a coffee shop. But those searched the sky in vain they did not see any trace of the mysterious machine. The two authors indicate that on September 22, 1954 there was an observation in Banyuls-sur-Mer, which description is identical to that of Dôle this same day and thus the explanation is also a meteor. A "long object," a flying cigar perhaps, zoomed over Banyals-sur-Mer [sic], France, on October 3rd. It emitted flames of green and red, according to the newspaper France Dimanche. 22. 22. Paris, France. France-Dimanche. 3 October 54. The website indicates that on 22 September 1954 at 23:00 in "Banyuls.Mer", France, "An unidentified object was sighted, but with appearance and behavior that most likely would have a conventional explanation. One object was observed." 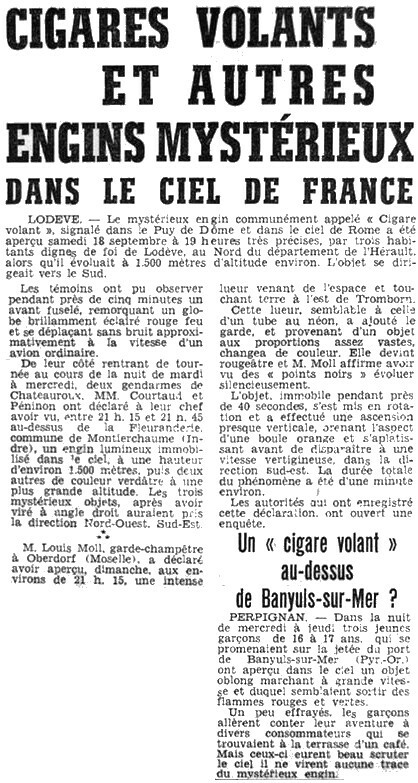 [in1] Article in the regional newspaper L'Indépendant, France, September 22, 1954. [bb1] "La Grande Peur Martienne", book by Gerard Barthel and Jacques Brucker, Les Nouvelles Editions Rationalistes publishers, France, pages 172,173, 1979. [lg1] "The Fifth Horseman of the Apocalypse - UFOs: A History - 1954 October", monography by Loren E. Gross, USA, page 4, 1991. 0.1 Patrick Gross December 17, 2005 First published. 1.0 Patrick Gross January 17, 2010 Conversion from HTML to XHTML Strict. First formal version. Addition [ud1]. 1.1 Patrick Gross October 23, 2011 Addition [in1]. 1.2 Patrick Gross December 5, 2016 Additions [pl1], [ub1]. 1.3 Patrick Gross Decemebr 16, 2016 Addition [lg1]. This page was last updated on December 16, 2016.